On a map, you trace your route and come to a fork in the road. Two diverging roads split from a common point and form an angle. The point at which the roads diverge is the vertex. An angle separates the area around it, known in geometry as a plane, into two regions. The points inside the angle lie in the interior region of the angle, and the points outside the angle lie in the exterior region of the angle. Once you get to know the types of angles and how to measure and create your own, you’ll have picked up valuable geometry skills that will help you prove even the most complex geometric puzzles. To do both tasks, you use a protractor, a very useful tool to keep around (see Figure 1). Figure 1: The handy-dandy protractor. When choosing a protractor, try to find one made of clear plastic. Figuring out the measure of an angle is easier because you can see the line for the angle through the protractor. Right angle. With this angle, you can never go wrong. The right angle is one of the most easily recognizable angles. It’s in the form of the letter L, and it makes a square corner (see Figure 2). It has a measure of 90 degrees. Figure 2: A right angle. Straight angle. You know what? It’s actually a straight line. Most people don’t even think of this type as an angle, but it is. A straight angle is made up of opposite rays or line segments that have a common endpoint (see Figure 3). This angle has a measure of 180 degrees. Right and straight angles are pretty easy to spot just by looking at them, but never jump to conclusions about the measure of an angle. Being cautious is best. If the info isn’t written on the page, don’t assume anything. Measure. Figure 3: A straight angle. Acute angle. It’s the adorable angle. Actually, it’s just a pinch. It’s any angle that measures more than 0 degrees but less than 90 degrees. An acute angle falls somewhere between nonexistent and a right angle (see Figure 4). Figure 4: Acute angles — at 45° (Figure a), 60° (Figure b), and 30° (Figure c). Obtuse angle. This type is just not as exciting as an acute angle. It’s measure is somewhere between a right angle and a straight angle (see Figure 5). It is a hill you must climb, a mountain for you to summit. It has a measure of more than 90 degrees but less than 180 degrees. Figure 5: Obtuse angles — at 95° (Figure a), 125° (Figure b), and 175° (Figure c). Angles are most commonly measured by degrees, but for those of you who are sticklers for accuracy, even smaller units of measure can be used: minutes and seconds. These kinds of minutes and seconds are like the ones on a clock — a minute is bigger than a second. So think of a degree like an hour, and you’ve got it down: One degree equals 60 minutes. One minute equals 60 seconds. 1. Place the notch or center point of your protractor at the point where the sides of the angle meet (the vertex). 2. 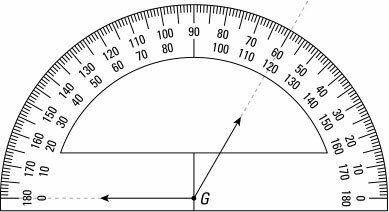 Place the protractor so that one of the lines of the angle you want to measure reads zero (that’s actually 0°). 3. Read the number off the protractor where the second side of the angle meets the protractor. Make sure that your measure is close to your estimate. Doing so tells you whether you chose the proper scale. If you were expecting an acute angle measure but got a seriously obtuse measure, you need to rethink the scale you used. Try the other one. If the sides of your angle don’t reach the scale of your protractor, extend them so that they do. Doing so increases the accuracy of your measure. Remember that the measure of an angle is always a positive number. So what do you do if your angle doesn’t quite fit on the protractor’s scale? Look at Figure 6 for an example. The angle in this figure has a measure of greater than 180°. Now what? Sorry, but in this case, you’re going to have to expend a little extra energy. Yes, you have to do some math. These angles are known as reflex angles and they have a measure of greater than 180°. Figure 6: Reflex angles don’t fit on the protractor’s scale, so you gotta do some math to measure ’em. Draw a line so that you have a straight line (see the extended dots on Figure 6). The measure of this portion of the angle is 180° because it’s a straight angle. Now measure the angle that is formed by the extension line you just made and the second side of the original angle you want to measure. (If you get confused, just look at Figure 6.) Once you have the measure of the second angle, add that number to 180. The result is the total number of degrees of the angle. In Figure 6, 180° + 45° = 225°.